You are sitting on a dock in a comfy Adirondack chair on a hot day, with a glass of lemonade filled to the brim with ice cubes. You decide to pick up a good book. You can’t get into a new mystery novel for some reason so you turn to your business books. You are a student of the industry, a lifelong learner, and you have a library of good books. Before you sit down into that comfy chair on a hot day, consider picking up one of these books. I chose them based on practice management topics for financial advisors and wealth managers focusing on productivity and capacity. I start with my newest book launched in 2016. 1. Guerrilla Marketing for Financial Advisors 2nd edition Innovating financial professionals through practice management”. 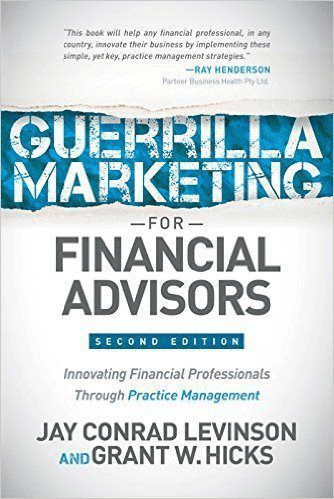 Grant Hicks and Jay Conrad Levinson Morgan James Publishing 2016“As part of the “Guerrilla Marketing” series which has sold over 21 million copies worldwide, financial advisors will find the book packed full of ideas to acquire ideal clients and create an ideal client experience. Utilizing “Guerrilla Marketing” strategies combined with key practice management research, the book guides the reader to tackle critical issues such as capacity, client acquisition, and double-digit growth. It is your process manual for practice management. 2. The 5 choices The path to extraordinary productivity, by Kory Kogon, Adam Merrill and Leena Rinne, published by Simon and Shuster 2015 : This book is backed by science and Franklin Covey's years of experience and research in this field. The 5 Choices will help a financial advisor or wealth manager increase their productivity and develop an inner sense of fulfillment and peace. The five choices are simple but require a radical shift in mindset and will lead to increased personal and professional success. It is your time management manual. 3. The Ensemble Practice, A Team-Based Approach to Building a Superior Wealth Management Firm, 2012 by Philip Palaveev Bloomberg Press 2012 . Why do ten percent of wealth management firms grow faster than the rest of the industry, often despite the turbulence of the markets? The answer, according to industry consultant and researcher, P. Palaveev, is that the most successful firms are those which, create and promote a team-based service model that serves as the foundation of their enterprise. It is your team building manual. 4. Succession Planning for Financial Advisors, + Website: Building an Enduring Business by David Grau Sr. Wiley Finance, June 2014 With all the succession discussions, why not just get it done. This book is a step by step guide and will challenge you and everything you think you know about succession planning. It is your succession manual. 5. Technology Tools for Today's High-Margin Practice: How Client-Centered Financial Advisors Can Cut Paperwork, Overhead, and Wasted Hours, by David J. Drucker and Joel P. Bruckenstein, Bloomberg Press 2013 With robo-advising on everybody’s radar screen, this will help financial advisors focus on what they can control, their processes. In a newly revised edition of the "bible" of practice management and technology for financial professionals, two leading financial planners, with some help from their friends, deliver the knowledge advisors have been begging for. It is your technology manual. Based on research, qualitative insight from hundreds of conversations with industry advisors, regulators, attorneys, academics and consultants, and data from over 1 million plans, Knull outlines the elements of a quality financial plan, how a quality financial plan is an effective and prudent way to comply with the DOL regulations and how it can help financial advisors differentiate their firms in a challenging environment. It is your advice manual. 7. The Enduring Advisory Firm: How to Serve Your Clients More Effectively and Operate More Efficiently (Bloomberg Financial) 1st Edition by Mark C. Tibergien (Author), Kimberly G. Dellarocca (Author) Wiley; 1 edition (November 30, 2016) Combining a facts-based approach with case studies and examples from the field, The Enduring Advisory Firm will ignite your imagination by demonstrating practical strategies for attracting clients and streamlining operations. It is your operations manual. If you would like to set up a complimentary call, for the opportunity to discuss the webinar, fee audits and beneficiary audits, or practice management, you can click the link if you want to talk for 30 minutes in the next month https://my.timetrade.com/book/JMTNJ or email me for our “Coaching Elite advisors” guide.